The posthumous publication of previously unavailable academic lectures by Karl Barth allows unprecedented access to the crucial formative years between the production of his two major masterpieces, the Commentary on Romans and the Church Dogmatics. Barth was professor at the University of Gottingen (1921-1926). It was here that he was to formulate many of the ideas that would later be developed or altered in the Church Dogmatics. Providing insightful comparisons and contrast with some of Barth's major contemporaries, Christopher Asprey draws widely on the lecture courses, as well as on other better known texts from the period, to give a comprehensive account of Barth's theology in these years. 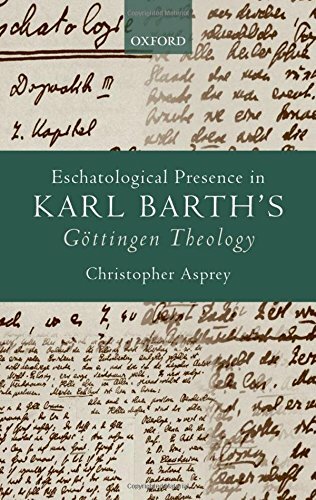 Unterricht in der christlichen Religion (Gottingen Dogmatics), the only full dogmatics cycle Barth completed during his lifetime, provides a key focus for Asprey's study. A picture emerges of Barth's concerns during this period that is different from many other established accounts: rather than being 'occasionalist' or dualist, Barth's theology in the 1920s was characterised by an orientation towards the eschatological encounter between God and humankind. Barth's intention in the Gottingen Dogmatics was to introduce his students to their responsibility before the Word of God, all other theological topics then flowing towards or from the 'dialogical' moment of encounter between this Word and human beings. This reading is borne out by in-depth analyses of some of the major themes in the dogmatics: revelation, incarnation, resurrection, pneumatology, moral and sacramental theology. While Barth's focus on the eschatological presence of God explains the freshness and immediacy of his writing in the 1920s, it is also shown at a number of points how this perspective generates various dilemmas in his theology, which remain unresolved during this period.